8'6" wide X 12' long + 2' V NOSE. The boxed, outer frame was rigid so the trailer didn t bounce or wiggle when loading and unloading sleds. It towed straight and steady without bouncing or swaying. The tall cap on top of 13-inch wheels attached to a rated 3,500-pound axle caught more wind than other capped trailers we ve used, which made our pickups and SUVs work a little harder and probably burn more fuel. We wouldn t trade the big wheels, though, because their larger tires are more durable, especially for long runs down the freeway. The cap is light and easy for a person to raise from the front or back to load or unload sleds. Four metal pins that secure the topper at the corners smoothly slide in and out of the hinge, but there s friction for a snug fit so they won t rattle and wear. The holes line up well, making the cap easy to use. Tie-down bars are simple like they should be. Just a crank and an aluminum bar instead of an over-engineered system that some other snowmobile trailer manufacturers use. The boxy shape isn t as pleasing to our eyes as other caps, but the square rear end lends more space for big stuff like ATVs and motorcycles or maybe even to haul your brother s 60-inch tube TV all the way from the era of the Indy XLT to a recycling center. 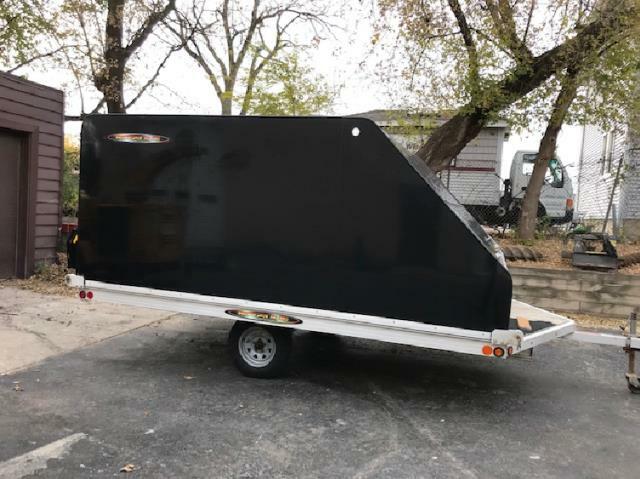 The ramp is light so one person can easily handle it, and the full-length groove along the back of the trailer lets users attach the ramp anywhere, offering flexibility to slide the ramp toward the center of the trailer for less interference with the cap s support legs while loading.